ANTISTRESS®can be taken by persons who are driving a vehicle. When taken regularly ANTISTRESS®® helps strengthen the nervous system and overcome nervous tension. ANTISTRESS® has resulted from a long-term research, based on which this particular unique combination was selected from among numerous herbs. 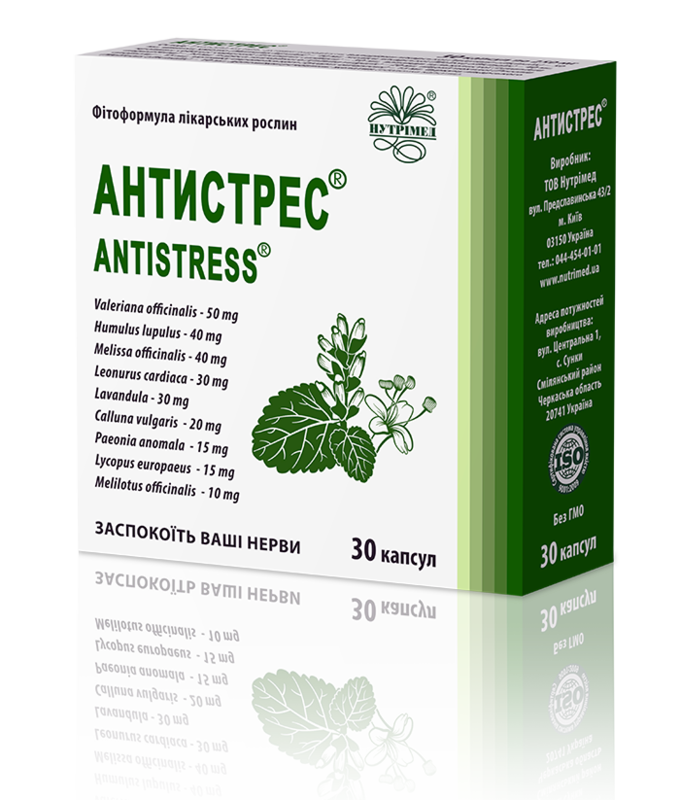 The medicinal herbs contained in ANTISTRESS® complement each other and have a mild and sparing effect on the body. A permanent stress causes nervous disorders, cardiovascular diseases, peptic ulcer, hypertension, and exacerbation of chronic diseases. The clinical efficacy of ANTISTRESS® was proven in a controlled, double-blind, randomized comparative trial that studied the treatment of patients with neurotic, stress-related disorders. ANTISTRESS® proved to be particularly effective during nervous tension and stressful situations. If you are an active person, nothing helps better than ANTISTRESS®! It will help you dive into an intensive stress-free work during the day and into a deep, healthy and trouble-free sleeping at night. NUTRITIONAL AND ENERGY VALUE (CALORIC VALUE) PER 100 G OF THE DIETARY SUPPLEMENT: proteins – 13.26 g, carbohydrates – 13.82 g, fats – 0 g; 111 kcal (464.4 kJ). RECOMMENDATIONS FOR USE: ANTISTRESS® is recommended for normalizing the function of the nervous system in persons exposed to mental and physical overstrain, chronic stress, as well as in case of insomnia. It does not impair the concentration power or cause muscle relaxant effects. METHOD OF ADMINISTRATION AND RECOMMENDED DAILY DOSE: adults should take 1-2 capsules 1-3 times daily after meals; for sleep disorders – 2-3 capsules 3 hours before bedtime over 1-2 months; the capsule is swallowed with plenty of drinking water. PHARMACEUTICAL FORM: capsules with the contents weight of 250 mg ± 10 %.